It’s the one Christmas card everyone loves to hate. The one with the folded Christmas letter printed on cheesy 8.5″ x 11″ Christmas theme paper, that goes on and on about the son who’s a Rhodes scholar or the exotic vacation they took. Well, to take the opposing view, I think Christmas letters can be very fun to get, if done right. Here’s how to write a Christmas letter without rubbing everyone the wrong way. First of all, it doesn’t have to be printed on cheesy paper. 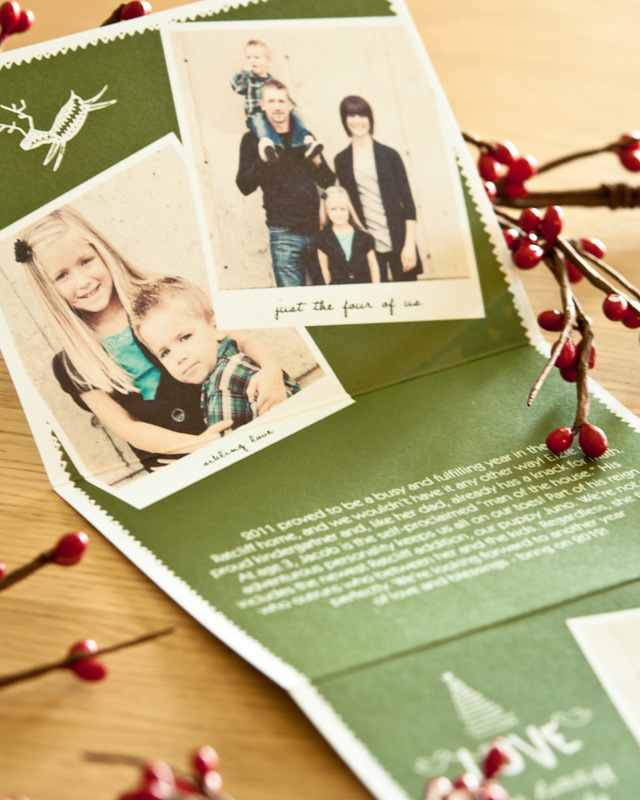 There are plenty of alternatives these days, from customized cards that let you type your letter right into them, to timeline Christmas cards that let you accompany each part of your story with a photo, to Christmas letter inserts that slip into coordinating creative Christmas cards. The trick is learning how to write a Christmas letter that’s entertaining, not annoying. It’s important to choose your words carefully, so as not to appear to be bragging (even if you are). Rather than listing the itinerary from your exotic vacation, for example, you can tell a funny story about something that happened on the trip, which will bring the story to life. Kids’ activities or college plans are fine to include, but awards and SAT scores? Not so much. Photos can be added to illustrate your story—close-ups are best. You can feature members of your family one by one, show highlights of your vacation or events during the year, or simply pick one nice group photo. The key is to give friends and relatives a glimpse of the real family behind the letter. If they know you and love you, they will love to read everything you have to say. Get more Christmas card wording ideas on our blog, or start creating your own modern Christmas letters now. I take your point about choosing your words carefully. This does require a good overview on the content from the reader perspective. It does take some skill to spice up the Christmas letter that we send to clients and contacts. Good post. Good advice. Letters always seem so weird to me to give or to receive for the holidays but I could definitely get into a timeline. That would be fun!